Image credit: Paul Hudson. 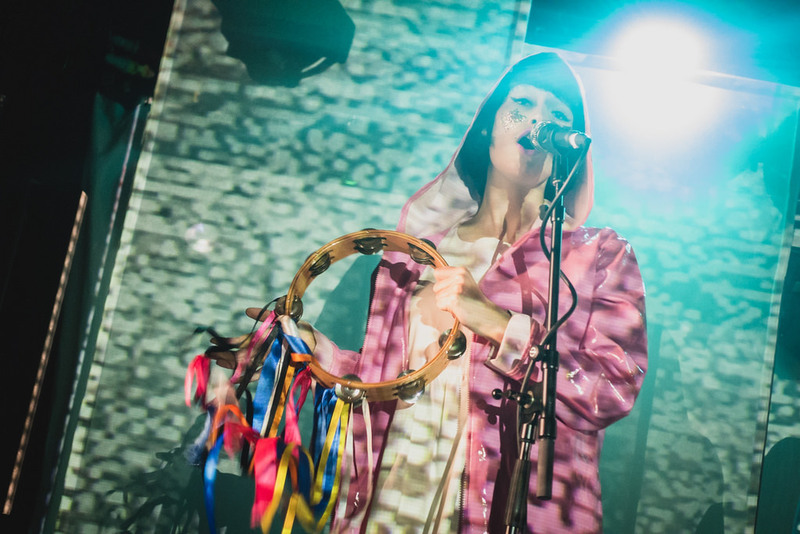 Description: B from Superorganism performing live on microphone. Ahead of their headline show at the O2 Academy Oxford at the end of the month, we catch up with B from Superorganism on the phone to discuss technology, band politics and performing live. “There’s something so affecting in the reflections on my screen” – Instagram, Facebook, Snapchat, YouTube, Twitter, Whatsapp – nerve centers of our modern communication, cyber-spaces for social life arrangement. If I want to meet up with someone I can just drop them a message, pick a time and a place, and then get out of bed, get ready for the world. These are the platforms where my public image is cultivated, my tastes and aesthetics defined: an alternative, personal universe with its own kind of histories, languages and feelings. When Orono, then, the lead singer of Superorganism, sings, “There’s something so affecting in the reflections on my screen”, she provides a poignant comment on how social media has somehow moled its way into all our emotional cores, for good or ill, with the appropriate ambiguity, and not a little melancholy. I’ve asked her whether she thinks we spend too much time with technology and social media, because that’s entirely what Superorganism seem to be about. From the origins of the inter-continental group, banded together with various combinations of New Zealand, London, Japan and the United States, to the way they produce their songs, Superorganism are a social media pop band on the cutting edge. In the beginning, they wrote their songs from different countries via social media. For their breakthrough hit, ‘Something for Your M.I.N.D’, uploaded onto Soundcloud in early 2017, so the story goes, Orono recorded the vocal from her college in New England, Maine within an hour of being sent the instrumental from the rest of the band in London, and that was that. “It was never meant to be the size it’s become.”, B admits. Now, all eight members of the band are very much living and working together in a peaceful, thriving creative community: “I’m actually astonished with how non-political it is. People assume there must be at least some big creative disagreements or infighting, you know, all of that stuff. I think there are no massive egos in the band. I think that’s what I could point to as preventing infighting. “When we decided we were going to make it a live project, and we were all just really keen to make it a multi-sensory experience, more of a performance and a show than your average rock concert. Superorganism play the Oxford O2 Academy on Tuesday 30th October. Be there. Running out of inc.: no world by inc.